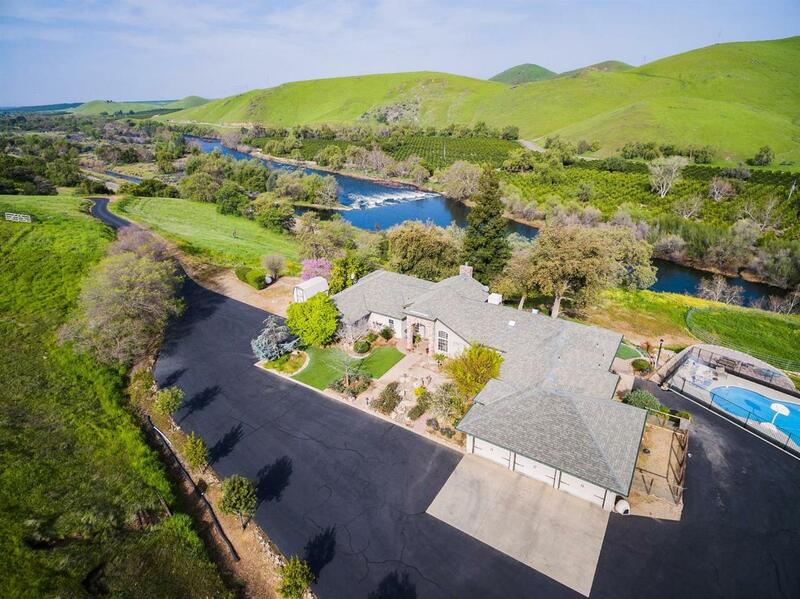 Drive up to your secluded getaway 15 minutes from Reedley/Sanger and 20 mins from Fresno/Clovis on over 39 acres and prepare to relax. This beautiful home features 4 bedrooms, 3 full baths in over 2600 sf and surrounding views. 10 minutes from Pine Flat Lake & Schoolhouse restuarant, once up top you will hear the soothing sounds from the river below and can see it from the backyard, or pool area. Once inside you will feel relaxed in this open floorplan and the inviting kitchen boasts custom cabinets, Thermador 5 burner with griddle cooktop, all stainless appliances including a wine beverage cooler. Three car garage, painted floors and insulated doors. 40 x 20 detached RV garage/shop,double insulated with lots of storage and a tackroom for your horses.There is a horse pen with misters and arena as well as plenty fenced areas for them to roam or if you have cattle, bring them too. No need to spend your saturdays mowing the lawn as it has been replaced with synthetic grass.